Our team of writers and photographers spans the globe, bringing their gardening tips and expertise to our pages. We pair this with honest reviews of our favorite gardening tools and supplies, thorough guides to the best outdoor furniture and decorative items, and the best-written resources that you can add to your library to take your skill in the garden to the next level. Every gardener out there can benefit from having floating row covers on hand. They’re lightweight, easy to store, and inexpensive. And their uses go well beyond frost protection. 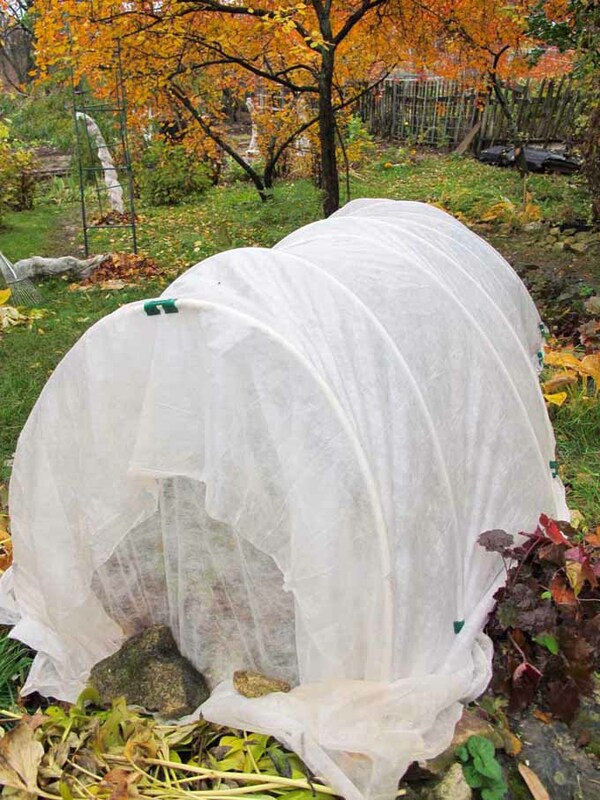 Don’t be discouraged if you aren’t up for building a mini hoop house either. In many cases, the garden fabric can be draped directly on top of plants and secured around the perimeter. So the effort involved is often minimal. 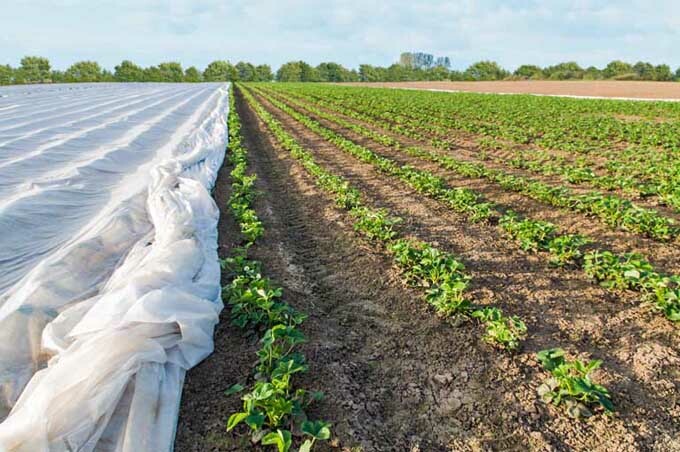 Floating row cover, also known as the garden fabric, is a white, thin, light piece of material used to shelter crops for a number of reasons, the most well-known being for frost protection. It’s typically made from polypropylene or polyester and doesn’t absorb moisture. It does, however, allow rainfall and sunlight to pass through. One piece can last multiple seasons, depending on how extensively it’s used each year. I don’t know a single gardener who doesn’t wish for more time every season. Well, the garden fabric can actually allow you more time to grow warm season crops. o keep plants protected from frost, you’ll need a heavier weight material that is specifically created to trap heat. 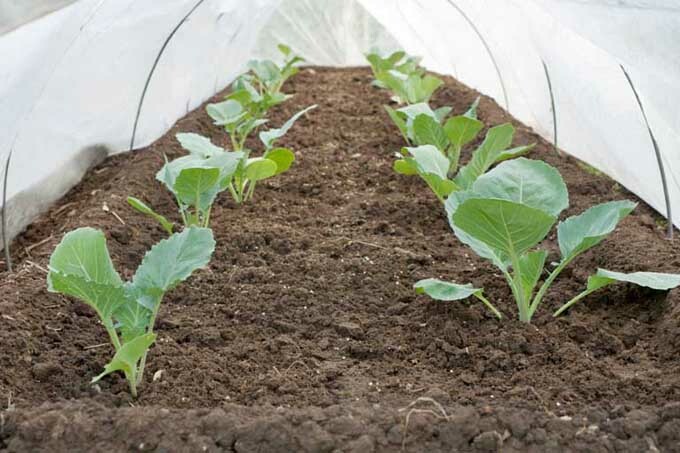 Gardens protected with heavyweight floating row covers are typically 4 to 10°F warmer during freezing temperatures. Knowing you have this option will relieve stress and give you the opportunity to set out heat loving, long season edibles, like tomatoes, bell peppers, and hot peppers, earlier than usual. Peppers especially need warmer temperatures to thrive, so employing garden fabric can really make a difference. Ideally they will allow for plenty of air circulation, but still, block a good amount of sunlight. Garden fabric is a great option if the weather starts heating up early in the spring, or at the end of summer when starting a fall crop. 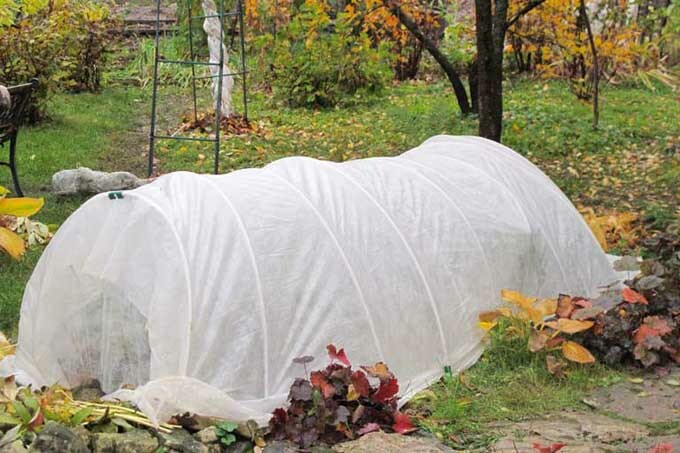 Although you can lay fabric directly over plants, consider building a permanent structure. This will allow you to use the material in a number of ways, and allow for easy installation. Do you have experience using floating row covers? What are your thoughts? We would love to hear about what worked and what didn’t. Growing tomatoes from seed is rather easy. Not only will you save money on buying from the produce department at your local grocery store, you will also save money on buying tomatoes plants when you grow them from seed. You can purchase seeds at your local garden stores and department stores with the garden department. For the price you would pay for one tomato plant, you can buy enough seeds to grow twenty or more plants for around a buck. Depending on the variety you may get up to 100 seeds for $1.00-$2.00. Below you will find that growing tomatoes from seeds is not only beneficial but very easy. The first step is to prepare your planting area. In this case, it will be your seed tray. Fill your tray with 1-2 inches of soil depending on its depth. Water the soil until it is moist but not soggy. You may need to water, let it set and then water it again to allow it to soak up the water evenly. Once your soil is nice and wet, you then want to create rows to plant the seeds. Using a Popsicle stick or other tool, make rows that are approximately ¼ in deep. Depending on how many tomato seeds you are growing, you may decide to simply create small holes with your Popsicle stick and drop a seed in each one. 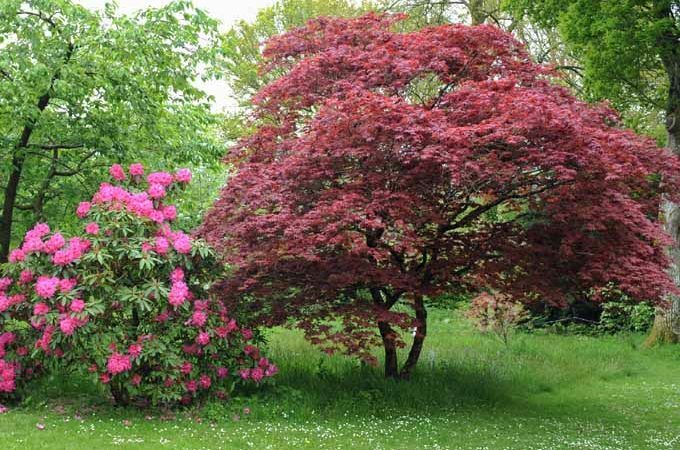 However, if you are planting a lot this could be very time consuming and take up more of an area to ensure that you don’t damage the previously planted seed. a few seeds at a time, and lightly sprinkling them down each row evenly. If you happen to get two touching don’t worry, they will still grow. 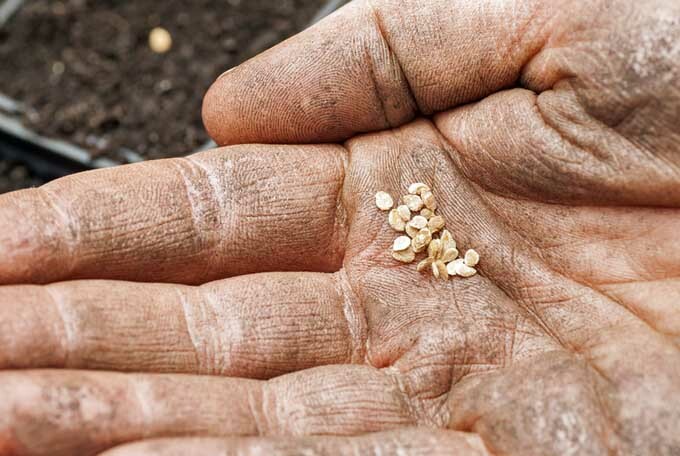 Once you have placed your seeds, go back and pinch the dirt in the rows to cover the planting. You can also use more potting soil to lightly cover if you choose. If you do add soil, be sure to lightly spray it down to give it some extra moisture. Once your tomato seeds have been sown, place the clear plastic dome over the tray. If you are using a greenhouse then the dome isn’t really necessary as long as you maintain a high humidity level. Once your plants begin to germinate, watch them closely. You will want to keep the soil moist but not soggy. They will get root rot if the soil is too wet. Once they get about an inch tall, you can remove the dome to allow fresh air to move through the seedlings. Allow them to grow 2-3 inches before transplanting. After your tomato plants have grown to 3 inches it’s time to transplant them. 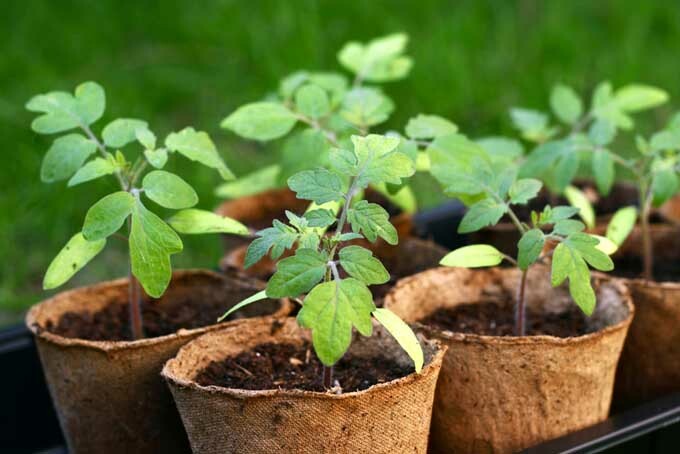 Using sterile pots made from burlap or peat (Styrofoam cups work well also), fill them to about ½ inch from the top with sterile soil. Moisten the soil just as you did with the seed trays. Again, you may need to water and wait a few times to allow it to soak in well. If using Styrofoam cups poke a small hole in the bottom with a toothpick to allow drainage. Using popsicle stick, create a hole in each pot that is about as big around as the popsicle stick and 2-3 inches deep. Once your pots are prepared it’s now time to start the main transplanting stage. Using a popsicle stick, gently slide it under the soil beneath a seedling and lift upwards to life the seedling. Always hold the seedling by the grown to ensure no damage is done to the stem. 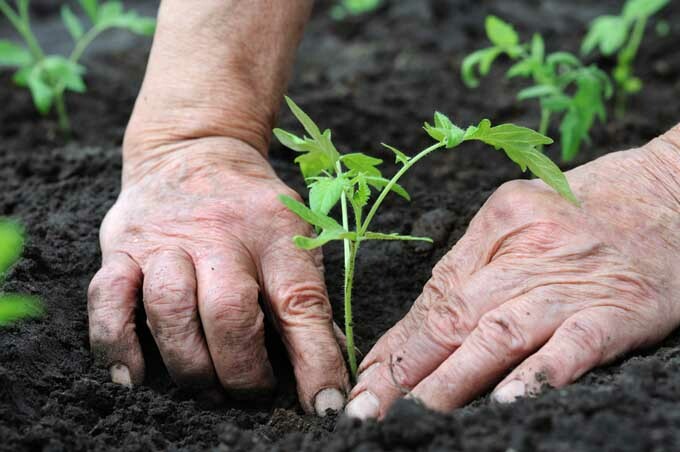 Gently pull the seedling upwards while pushing the soil and roots up and the same time. Once your seedling is removed, place the roots and stems into the holes in each container. Plant it as low to the crown (or baby leaves) as you can without them actually setting on the soil. Secure the soil around the tomato seedling and move on to the next. Once you have potted the entire tray tomato seedlings, you can now place them in front of a sunny window and continue to water them routinely. Be sure to check them every day to ensure that they have dried out. A few sprits of water from a water bottle works great on a daily bases to ensure high humidity and help the leaves take in water since their roots are still growing. As they grow you will see their true leaves begin to grow and then from there on your tomato plant will take off. You will need to replant them in a few weeks, either in the ground, growing bags or bigger pots depending on you gardening preferences. Water, fertilize and weed regularly to ensure healthy, vibrant tomato plants that will last for many months! For something a little different, tomatillos can also be grown in a similar fashion. start theirs from seeds indoors.